**She wants the "Pride is Forever" display. Heather please email me to claim your Prize. Thanks to Gone for a Run for Hosting!! Keep Gone For a Run on your mind for Christmas Shopping!!! I plan to run today with the Awesome Kerrie @ Mom vs. Marathon today.. I have really diverted off of my usual workout schedule and I want to get back to it.. Staying motivated the last month of the year when the temps start to drop and we have busy schedules is HARD... I was excited to find some motivation through Run With Jess HERE and her 12 Days of a FIT Christmas. The premise? 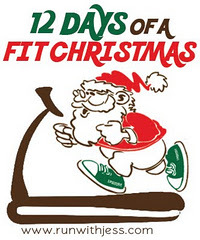 Workout, post a comment that you worked out and you will be entered to win PRIZES for 12 days!! I love the idea and will be participating for sure. GREAT idea Jess!! Is it possible for me to run a minimum of 1 mile every day?? It is no streak like Shelly HERE who is on day 571 of her EPIC Running Streak..
Could I (we) do it?? I have already hit my 1,000+++ miles for the year. I have been aching for a CHALLENGE.. I would get credit for the first 12 days on Jess's challenge.. And I want to motivate the Tall Mom 1,000++ participates to PUSH this month..
Leave a comment to let me know you are IN!! PS- Those who complete the CHALLENGE will have a chance to WIN.. Details soon.. I'm in! I've found it difficult to stay motivated and stop coming up with excuses lately. Hopefully this challenge will do the trick! I am in Mel. I am not going to make my 1000 miles this year because of an injury, but I am back and need something to keep me motivated! I'm in! I hope I can do it! I'm in!! I tried in November but was laid low by the creeping crud! 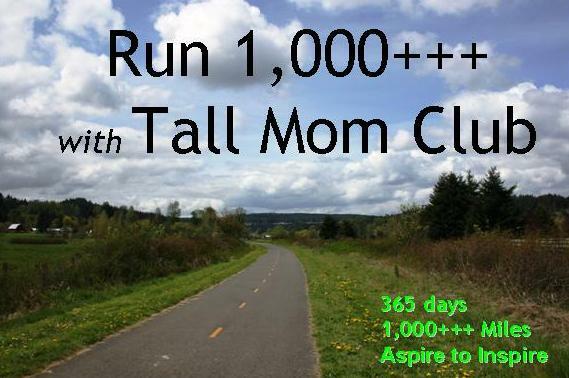 quick question: would that be an actual mile a day...or as long as you totalled 31 miles for the month of Dec? I'm already thinking 12 days in a row for Jess is gonna be hard ~ not sure i can guarantee a mile a day (which is why i haven't joined the streak), but i could do 31 total! Lemme know, please. Thanks. I'm totally in! I need to run ~50 miles this month to hit my goal of 700 for the year, 100 more than I ran last year. This will help me stay on track. Thanks! Count me in. Perfect motivation to do something each day. I'm in! I could use it... I did 3 this morning, and thinking about doing another one for fun this afternoon just because it's pretty outside. I was just thinking about bailing on my run tonight. This challenge is motivating me to hop on that treadmill after work! You know I was just thinking about doing a "mile-a-day" by myself, but this makes it even more hard to pass up. I'm IN. I've already started two days ago...hee hee! We need to meet up SOOOOOON. I'm in! Great idea. It will be great to have something to keep me motivated over the holidays. All those CALORIES!! I don't know if I will make it but I will try! Can walking count? I have been taking mile and half long "lunch" walks. I am in. I joined on daily mile. I also finished my 1000 miles, but won't make 2,000. I was looking for some goal to complete the month. Thanks! I am IN! I'm confined to a lot of treadmill running right now and just talking myself into getting on the treadmill is hard, but one mile really isn't that hard...right?! I joined on Daily Mile. I am already running daily from thanksgiving thru New Years on another blog . . . so what the heck! I think it's a super idea!! Showing people that exercise can have a place every day is important. Purposeful Daily Movement. Yipeee! A whole month of fellow streaks. I love it!